As he slowly fades away due to Alzheimer’s, I think it appropriate that we take a look at the long and illustrious career of Glen Campbell. Assessing Glen’s career is very difficult because he was so very talented. As a singer and musician he probably was as talented as anyone who ever graced the American musical stage. Over the course of his career Glen placed eighty songs on Billboard’s Country, Hot Hundred and Adult Contemporary charts with many of the songs appearing on multiple charts. Many of his singles charted in England, Australia and Ireland, with scattered hits in non-English speaking countries. Glen could sing anything and sing it well, be it rock and roll, country, pop standards, rhythm and blues or folk. Jimmy Webb heard an early Glen Campbell single on the radio and decided that he wanted Glen Campbell to sing his songs. 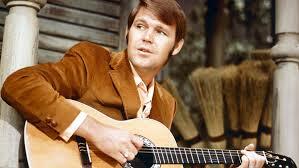 As a musician you can hardly name a stringed instrument that Glen Campbell couldn’t play. He was a wizard on the twelve string guitar, six string guitar (electric and acoustic), bass, banjo, fiddle, If you can name it, Glen Campbell probably could play it. Although Glen was not especially known as a songwriter, he did pen a few songs. He might have written more songs, but with the top songwriters of the day pitching their best material to him, there wasn’t a compelling need for him to do so. Glen Travis Campbell was born in 1936 in the town of Billstown, Arkansas; however, he was usually billed as being from the nearby town of Delight, Arkansas. He started playing guitar as a teen and moved to Albuquerque in 1954 to play in his uncle’s band and later to form his own band. In 1960 he moved to Los Angeles to become a session musician, playing on recordings by artists as diverse as Nat King Cole, Frank Sinatra, Elvis Presley, Jan & Dean and Ricky Nelson. He also became part of a group known as the Champs and obtained a recording contract with Crest Records. In 1962 Glen signed with Capitol Records. Capitol had great faith in the Glen allowing to record five non-charting albums and a bunch of relatively unsuccessful singles before finally achieving his first solo top twenty country single with “Burning Bridges” in 1966. Along the way he became a touring member of the Beach Boys, filling in for Brian Wilson on road dates. Capitol Records teamed Glen with producer Al DeLory in 1966. The first collaboration, “Burning Bridges” got the ball rolling for Glen. From that point forward over a decade’s worth of hit singles and best-selling albums would follow, along with a television show, movie roles and many concert appearances . Although Glen’s recording career would cool off during the 1980s, he would continue to place singles and albums on the charts through the end of the decade and into the early years of the 1990s. A brief renaissance would occur after 2005. Our spotlight series will start with Glen’s first platinum album Gentle On My Mind, but the five albums that preceded it are worth investigating as they will show Glen in a variety of setting of musical settings from bluegrass to traditional country to folk to rock to pop country. I would particularly recommend checking out The Astounding Twelve String Guitar of Glen Campbell and The Big Bad Rock Guitar of Glen Campbell to get a dose of Glen’s awesome instrumental prowess. We are proud to present Glen Campbell as our November Spotlight artist.